THE SEISMIC COMICS EVENT OF 2018 STARTS HERE! From New York Times best-selling writer Matt Kindt (X-O MANOWAR. 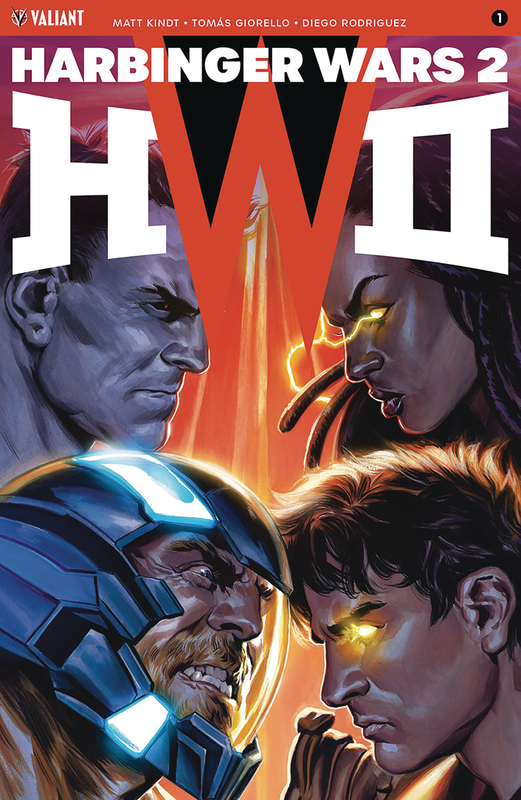 DIVINITY, Mind MGMT) and superstar artist Tomas Giorello (X-O MANOWAR), the most powerful Valiant event ever attempted erupts in full force as X-O Manowar, Livewire, the Harbinger Renegades, Bloodshot, the Secret Weapons, Ninjak, and a cast of thousands draw their battle lines in HARBINGER WARS 2! For the rare and immensely powerful subset of humanity known as psiots, their unique abilities have come with an enormous cost. Once, their existence was known only to a select few. Now, the revelation that thousands of these latent telekinetic 'harbingers' secretly live among us?with the potential to become active at any moment?has led the American government to a dramatic tipping point? Armed with new extra-governmental authority, the deep-black military contractor known as Omen has been authorized to identify, evaluate, and, if need be, eliminate all super-normal threats to the homeland. H.A.R.D. Corps units have been deployed into cities and towns across the United States to enforce their orders. In the East, one of the most powerful minds on Earth, Peter Stanchek, is leading his band of Renegades across the country, activating any potential psiots willing to join them, and building an insurrection force of ultra-powerful and unwieldy new abilities that will soon bring war to Omen's doorstep?and the unstoppable force known as X-O Manowar raging back to Earth? In the West, Livewire - the telekinetic technopath with the ability to bend machines and computers to her will - will be forced to choose between her former allies?or her newfound team of Secret Weapons. As the situation escalates beyond human control, the United States will be plunged into darkness from coast to coast, launching Bloodshot and Ninjak into a dangerous mission to neutralize their one-time teammate - and setting the stage for the most shocking, most violent, and most consequential clash of powers ever witnessed in the history of the Valiant Universe!